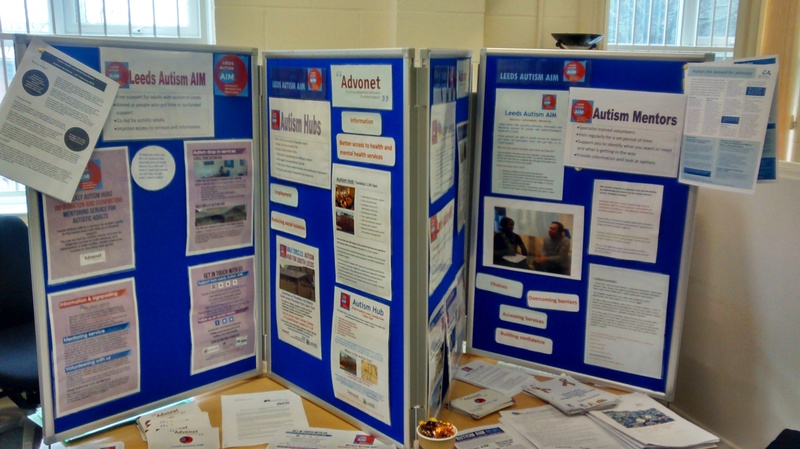 Leeds Autism AIM is a free service for autistic adults in Leeds who receive little or no funded support. It was founded in late 2014 by Advonet (formerly Leeds Advocacy) and is co-led by a number of autistic adults and carers/parents of autistic adults. We developed the service after running some specialist autism advocacy and mentoring provision. It was set up with autistic adults because there was a need identified for ongoing support to help people achieve their potential. We offer three main services – advocacy, information and mentoring. We run a weekly drop-in at Lovell Park on Tuesday afternoons and a quieter weekly one at the same venue for booked appointments and groups. We can offer advocacy support at our weekly drop-in on Tuesday afternoons, or at our weekly Friday hub session for booked appointments only. Some of our paid staff do advocacy work, some of whom are autistic themselves. Information and signposting are both major parts of what Leeds Autism AIM can offer. You can find info and get signposted to services at either of our two autism hubs, via email or phone or through our website. We can arrange to meet you at either hub if you want to know about a specific topic. Our mentoring service provides one-to-one support by matching you to a specialist trained mentor. The mentor can meet with you to help identify goals and help to develop a plan to overcome barriers to achieving them. Some of our mentors are autistic themselves, whilst all of them receive awareness and mentoring training before they’re ready to be paired with a mentee.